The diabetes managment panel checks blood and urine markers used to manage diabetes. What is the diabetes management panel? This diabetes management panel measures the glucose & hemoglobin A1c blood levels and the urine microalbumin level. Why is the diabetes management panel important? The diabetes management panel is important because it helps diabetics make sure that their diabetes is managed well. This Diabetes Management Panel is a blood and urine test. The diabetes management blood test panel tracks lab markers that help with the management of diabetes. This diabetes management lab test panel builds on the diabetes screening panel and includes the glucose test, the hemoglobin A1c test, and the urine microalbumin test. This diabetes management test panel lets people with chronic diabetes track important lab markers to help make sure that their diabetes is well-controlled or adjust diet, medications, or both as necessary. People with diabetes face unique medical challenges because elevated blood sugar levels can, when not well-managed, lead to tissue and organ damage (sometimes irreversible). Most diabetics recognize the importance of tracking glucose and hemoglobin A1c levels as markers of how well one's blood sugar is controlled at a point in time and over the past months. Microalbumin, while sometimes lesser known, is also important as it is helpful for identifying an organ that is often on the receiving end of poorly controlled blood glucose levels - the kidneys. To get the diabetes management panel near you, order online and get your blood drawn at the Quest Diagnostics lab that you selected. 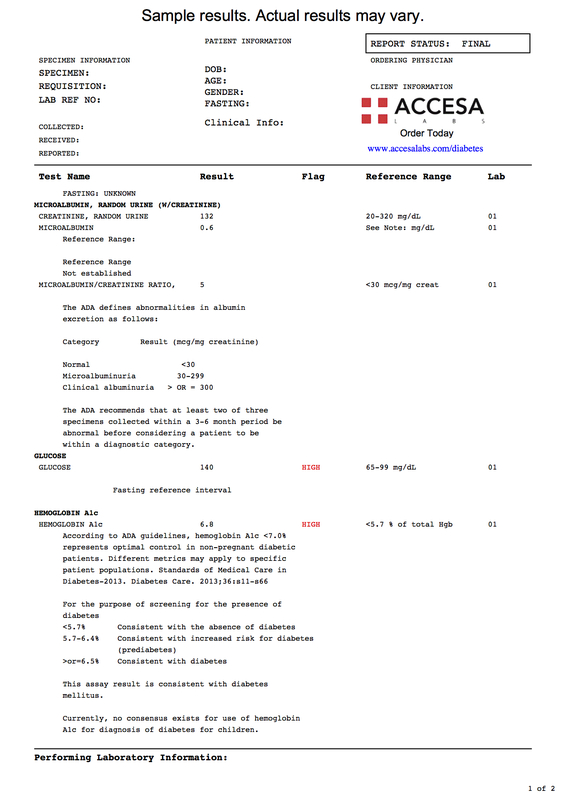 Once your diabetes management lab report is ready, it will be available for download. As can be seen on the sample diabetes management panel lab report, the individual diabetes management components will be reported as a numerical values and can be compared against the reference ranges provided by the lab. For best results, an overnight fast (8-12 hours) is recommended before getting tested for this diabetes management test. Some people with diabetes will check these screening markers on their own schedule (for example, monthly or quarterly) to stay on top of how their diabetes is progressing, even if they are not making rapid adjustments in their lifestyle or medication dosages. Diabetes Management Panel at Guaranteed Prices.